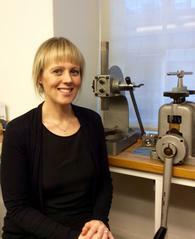 Emma, you have studied at Loughborough University, England, in 3D Design Jewellery & Silversmithing and have been working as a designer and jeweller at Bill Hicks Jewellery Design for six years. What’s your motivation to work for a business that only creates unique pieces? I absolutely love the fact that although you will pay a little more there is absolutely no process or technique that will even compare to something handmade especially when you are talking about an engagement ring or a wedding ring that you will want to have forever. I have such a passion for making jewellery and knowing that each piece I produced will last and be well constructed makes working for a business like this enjoyable. The world which we live in today is a very different one, even to when I was growing up in school. Trade skills were very highly regarded and a bespoke handmade piece would often be the only form of manufacturing, especially when it came to jewellery. The same still applies today but we are constantly competing with technology and mass manufacturing has put our skills to the test. What was once only a special sector of us in the industry that could create something unique has now been replaced by high commodities of products and even services that have flooded the market. A large part of the jewellery trade has in essence become a market place of mass manufacturing, producing what I see as a second rate product. What’s the advantage of manufactured jewellery? Being a bench jeweller I will always say casting is second class compared to something that is handmade. You will always tell a high quality piece of handmade jewellery from an inexpensive cast version. The weight of a piece is a good place to start. Cast pieces can feel light and look too precise, let’s say lacking in finesse. The advantage of manufacturing a piece of jewellery is the ability to have artistic licence and create something with flair that a machine or mass production never quite seems to achieve. You can work in more detail and create more fluid lines. Although CAD/mould made pieces are extremely accurate and symmetrical there are limitations to many of the designs. Manufacturing a piece of jewellery does have its benefits to the customer, the labour costs are generally less and the piece is pretty much guaranteed to be extremely accurate. Longevity is the word we associate with handmade pieces. Which of the pieces you’ve created, you remember the best? What was so special about it? I will always remember the first engagement ring I made in this country and for Bill. 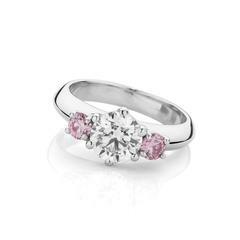 I went in at the deep end making a three stone platinum ring with two pink diamonds. It was a very expensive ring, as you can imagine I wanted to get it right and for the customer to be happy especially as it was my first job, thankfully I achieved this. This was memorable as it marked how I wanted to go on. How does the customer affect your artistic trademark? Is it hard to keep a balance between the customer’s idea of a good design and yours? You always have to listen to the customer and how they would like their engagement ring to look. Some have very fixed ideas and others are happy to take advice from us. There are customers who want very impractical designs, the only thing you can do is guide them, let them know the pit falls and suggest ways to counteract the problems without compromising their ideas too much. We never make anything we feel will not last or will be unsafe. However, the most important thing for me is not my artistic trademark, but creating a personal piece of jewellery – I use my knowledge to make customers design ideas come true.